The Best Things in Life Are Free...Like Costco Samples. I wonder if cults buy their caskets in bulk from Costco? Looks like my wife isn’t getting rid of me for awhile, she bought me the big bottle of shampoo from Costco. Beg in front of Costco. No one needs all 15 cans of ravioli. I needed 8oz of cream cheese for a recipe. I didn’t want to go to two stores so my refrigerator is now well stocked with 96 oz of it thanks to Sam’s Club. Went to Costco on my break, for trash bags and toilet paper, came out with a home security system, a fancy trash can, a tub of beef jerky, and a jacket. What DOESN’T Costco have. You can stock up on peta chips, buy an engagement ring, get ya some fresh new sketchers, samples at every corner, stock up on tide pods, AND plan your next cruise ??? 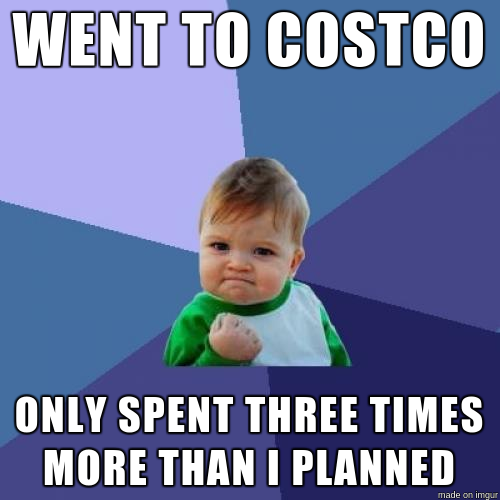 Went to Costco today to get a $1.50 hot dog. Ended up costing me $200. Emily Parker is a musician, writer, and avid reader who started Bucket List Book Reviews, the ‘1,001 Books to Read Before You Die’ project. For Sweatpants & Coffee, Emily hopes to inspire the reading of the classics by a whole new audience by only reviewing the really good stuff. Ah, leftover Halloween candy. The breakfast of champions. We're not the only ones who tweet about coffee! Junk Drawers are like opinions. Everyone's got at least one, and they're mostly full of crap. Too true! We’ve been Sam’s members since 1995. We’ve learned to be very selective in our purchases there. And now since we’ve moved to a city where there is also Costco, we have to be doubly vigilant!! Love the collection you posted!